The bees are bringing in pollen like crazy. 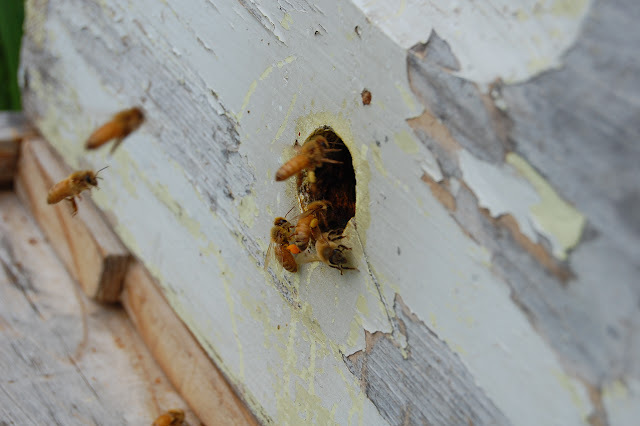 It’s a good sign: they’ve found nectar, they’re pollinating the trees on the farm, and they’re feeding the brood (baby bees) inside the hive. The larvae need a high protein diet, and they can’t get it from just nectar, so they are fed “bee bread,” a mixture of pollen and honey. 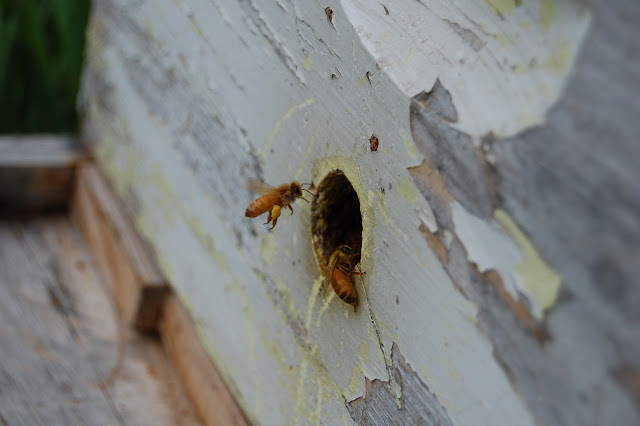 These workers are bringing pollen into the hive. You can see the pollen sticking to the workers’ hind legs. Bees mix dry pollen with nectar and have special sticky hairs and a cup-like pouch to hold the pollen to their legs. That pouch is called a corbicula, or “little basket.” There are a couple guides to identifying plants by the color of the pollen the bees are carrying. I’ve seen bright orange, light grey, and yellow pollen coming in. The orange is probably dandelion, grey could be blackberry (we just planted some canes a few weeks ago – I’ll have to check if they’re blooming yet) or plum, which is more likely. The yellow could be a number of different things including cherry and apple. The following video is a series of photos from that same hive, taken a second or less apart from each other. It comes out to about real time, and you can really see the amount of traffic going in and out of the hive. 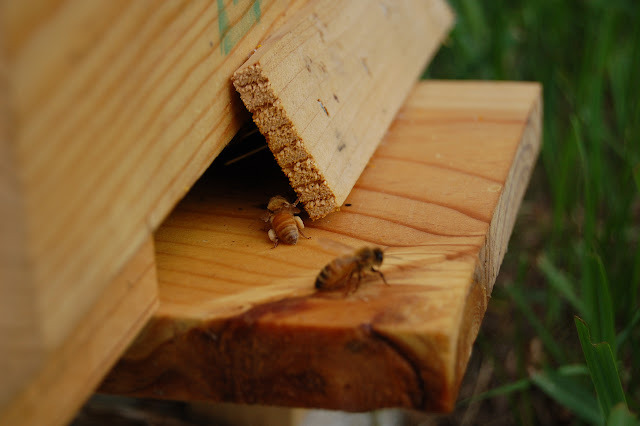 I have a series of photos from each hive at the farm, but I think this one is the clearest and most exciting. This is that feeling when you have a brilliant idea and it fails and then you spend a day pulling up grass and dandelions because by the time the weed-free project failed it was too late and we were too busy to do anything about it. #lessonslearned Here’s to another year of brilliant ideas, more hands to share the work, and all those worms that loved my weedy field last year.